‘Israeli’ occupation soldiers assaulted and injured on Sunday hundreds of Palestinian political prisoners in al-Naqab Desert Detention Camp, after they invaded the detainee’s rooms and tents; at least seven of the wounded detainees were moved to hospitals. In recent updates, the Palestinian Prisoner Club announced that the “Israeli” administration at al-Naqab Prison chained 240 Palestinian prisoners keeping them in the cold weather in the prison’s yard since Sunday’s evening. Also, the “Israeli” Prisons Service prohibits the visits of Palestinian prisoners’ families until further notice. Relatively, Maan News Agency reported that the detainees are held in Sections 3, 5 and 7 of the detention camp, and quoted ‘Israeli’ media outlets claiming that two soldiers were stabbed, including one who sustained serious wound to his neck. 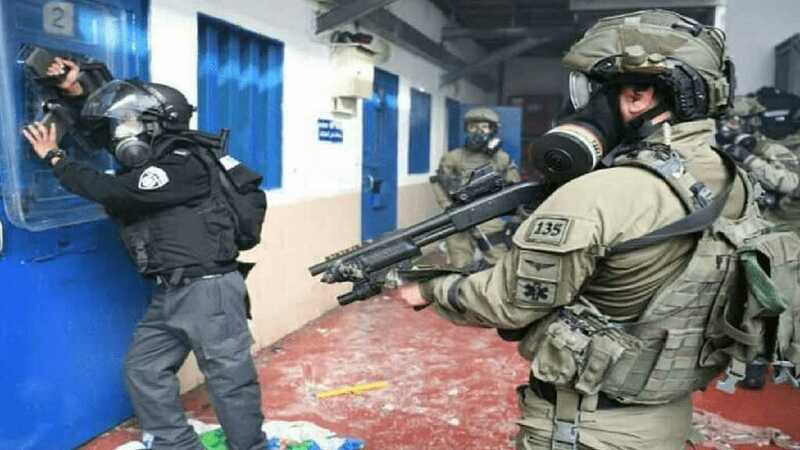 The tension started after dozens of ‘Israeli’ Special Forces soldiers invaded the detainees’ rooms and tents, and started assaulting them while conducting very violent searches. Several detainees were injured before it was reported that a few detainees, believed to be members of Hamas, stabbed two soldiers. The army then started firing dozens of gas bombs, before assaulting and wounding dozens of detainees. ‘Israeli’ sources, meanwhile, claimed that the soldiers were injured when the prison administration moved all detainees, who are believed to be members or supporters of Hamas, to another section. The Detainees’ Media Center said the Zionist army turned the prison into what seems to be a battle ground. It added that al-Naqab Detention Camp has been witnessing serious ‘Israeli’ violations and escalation, since last month, when the army installed devices to scramble TV and Radio signals. There are at least 1300 Palestinian detainees held in al-Naqab Detention Camp, which was first opened in 1988 after the First Palestinian Intifada started less than a year earlier. The prison camp was closed after the so-called Oslo agreement, but the Zionist entity reopened it in 2002, after the army conducted its massive invasions across the West Bank; it is located northwest of the ak-Naqab Desert, close to the Egyptian border.